I recently had a friend over from Southern Brazil for a few days in Dublin, and a bit of fishing. Being based in Dublin city, Sidnei wanted to explore some of our local waters. he was keen to see Poulaphuca Reservoir and wanted to try for a Pike. I used to fish there a lot many years back, and indeed 20 years ago I caught my first 30 lb Pike from that very water,a fish weighing 30 lb 2 oz. Since then it has produced a lot of big fish. Sidnei was keen to get afloat on the lake, so we went to Ballyknocken and started out from there. This is on the Vallymount side of the lake and we headed for the well known area at the incoming rivers,always good at spawning time.This time however, the fish I think had already spawned and there was very few about.The only action was a fish that came off after a few seconds on a large grub bait, fishing over a drop off. A decision was made at lunchtime to spend a few hours trolling our way back to base with various lures,but to no avail. 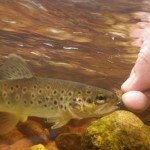 The next day we targeted Trout on some small streams on the Wicklow/Carlow border. Sidnei normally fly fishes for Peacock Bass and uses heavy rods and large flies on some of the Amazon. 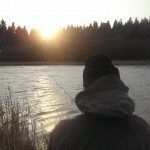 Here he loved the light fly outfit and over the space of the day and 3 different streams, caught a nice few Trout. None of them were big,but all very welcome and beautifully marked. Most took dry flies and also a few on beaded nymphs. the fish were quite lean but gave him great sport. 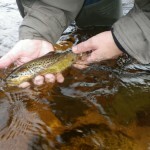 Sidnei is now coming back for another try at Irish Trout in May, this time on the great western loughs,and then to Kerry, for some Sea Trout and maybe a Bass. Their boats are excellent, all clean,well maintained and good value and also come supplied with anchors etc. 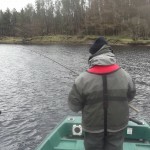 This entry was posted in Guiding and tagged Blessington Lake, Blessington Lake Boat Hire, Pike Fishing, River Liffey, Trout Fishing. Bookmark the permalink.